D-Link is an industry leader in network solutions and the DAP2590 is one of its latest products for small to mid-sized enterprises. It comes with great security features, remote management options and wireless standards that provide safe, secure and high speed wireless local area networks (WLAN) for the end users. With enhanced coverage features, multiple operating modes and support of Power over Ethernet this device can be deployed in any settings to extend the wireless networks or set up a new wireless network. It is priced at around $390, but its features and functionality justify the cost. 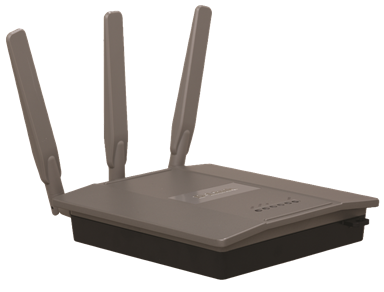 Wireless Specifications: The DAP2590 is a dual band wireless n router that is also backward compatible with 802.11 a/b/g standards. It can operate in the 2.4 GHz range to support devices with wireless b/g/n technologies and in the 5 GHz range to support devices with wireless a/n standards. It can operate in the dual band simultaneously increasing its ability to serve devices in an interference free manner and improve the overall wireless network performance. To enhance its reach and coverage DAP2590 comes with three detachable antennas. These antennas help extend the range of the unit and also provide a degree of spatial diversity making wireless network robust against stray interferences. To top it all, the access point also supports Power over Ethernet standard which allows it to draw power from the Ethernet cable rather than use a dedicated power supply. This is very significant in enterprise deployments, as getting a power outlet in the right places can sometimes be really tough. With the PoE solution, the access point can be placed in the most suitable place without any consideration for the power outlet. Wireless Security: On the security front the device supports Wi-Fi Protected Access (WPA) encryption protocol and the 802.1i (WPA2) solution. WPA is one of the most secure encryption standards in the industry today. With the WPA2 access and support for RADIUS server, the device enhances the overall wireless network security while ensuring that existing enterprise security setup need not be altered significantly. With the RADIUS server support, any new device requesting access to the wireless network is authenticated by the server rather than just the access point. This way DAP2590 helps maintain the high enterprise security even in the wireless networks. The device also supports disabling and enabling SSID broadcast. Typically, if the SSID broadcast is disabled, wireless devices will not see it in the list of available networks. This provides a good level of security preventing stray access points from trying to gain access to the network. MAC Address filtering is another security layer where devices are filtered based on MAC addresses to grant access to the network resources. Rogue AP detection is vital in larger wireless networks as it ensures that even access points that aim to join in the WLAN are authenticated and stray devices are blocked. The access point also provides wireless client isolation where in two directly connected devices cannot establish a point to point link between themselves to share information. Finally the device can support as many as 8 VLANs and multiple SSIDs. VLANs help segregate traffic and ensure that devices in different VLANs do no accidentally communicate with each other. The multiple SSIDs help reduce the capital expenditure for the enterprise with a single physical access point performing the role of multiple devices. Operating Modes: The device operates in four modes. The table below gives a brief overview of each of these modes. Access Point (AP) In this mode, the device acts as a hub for wireless devices to connect to the wired network. The LAN port is wired to one of the network devices like a switch or a router. 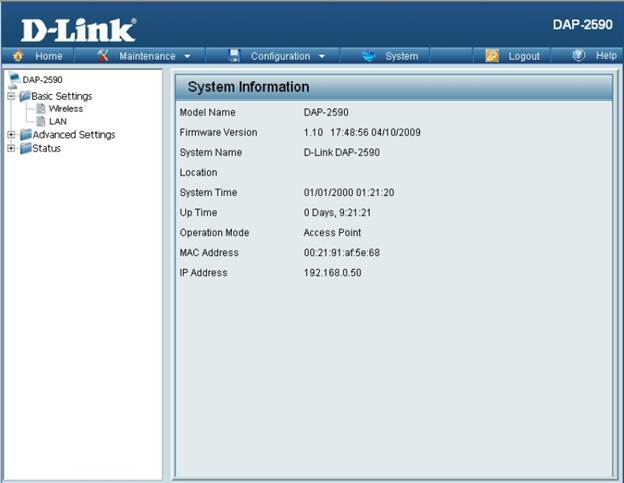 Wireless Distribution System (WDS) In this mode, the device does not connect individual wireless devices, but bridges connected LANs or other wireless networks. The network of DAP2590 devices can be configured for load balancing and redundant protection too. WDS with AP In this mode, the device provides WDS functionality with connection to individual clients too. It is a combination of the first two modes. Wireless Client In this mode, the device acts as a wireless client rather than an access point. Typically, wired Ethernet devices that need to connect to the WLANs can be hooked up to a DAP2590 and it can then connect to existing wireless networks as a client. Configuring the Access Point: Follow the steps mentioned below to connect to the access point and configure it. Enter the username as admin and leave the password field empty. Login to the device by clicking ok.
DAP2590 Basic Settings page is displayed. Access the various menu items on the left panel to configure the device and the wireless network.